These Michigan Stone Night Lights are cut to the shape of lower Michigan. The stones of the night lights are available in Dolomite, Onyx, and Petoskey. The Michigan stone night lights are a beautiful accent to any room and measure approximately 4″ x 3″ x 2″. 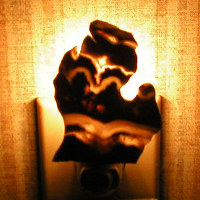 A Michigan night light is perfect for a housewarming or hostess gift. Also makes a beautiful and unique gift for bridal shower, birthday, fathers day, retirement, anniversary, or new job.